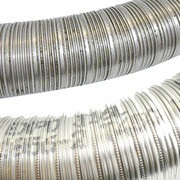 Stainless steel flexible flue liners are designed for lining an existing flue or masonry chimney. Multifuel flexible is a twin skin chimney liner designed for gas, oil and multifuel, where the maximum flue gas temperature does not exceed 600Â°C. There are two grades available, 316L and a higher grade of 904L which is suitable for the extreme conditions found with coal based solid fuel installations. Gas, Oil and 316 grade multi fuel flexible liners carry a 10 year conditional warranty, whilst 904 grade multi fuel flexible liners carry a 25 year conditional warranty. However, the flexible flue liner must be correctly sized, installed, and properly maintained, burning only approved fuels in accordance with the appliance manufacturers instructions.